MGM Mondo del Vino is a large Italian wine producer founded in 1991. Today, the company is one of the top exporters of Italian wines, which are produced from a multitude of Italian regions spanning from Piedmont to Sicily. Terre Siciliane is the region-wide IGT title for the island of Sicily. It was created in November 2011, to take the place of the erstwhile ‘Sicilia IGT’, which had just been promoted to DOC status (as Sicilia DOC). Indicazione geografica tipica (IGT) is the classification created to recognize the unusually high quality of the class of wines known as Super Tuscans. IGT wines are labeled with the locality of their creation and offer great value for the price. The name Terre Siciliane translates literally as ‘Sicilian lands’. This is a Sicilian red blend of 75% Nero D’Avola and 25% Frappato. 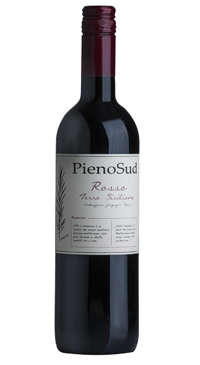 A juicy, well-balanced wine that captures the sunshine of Sicily, with a blend of ripe red fruit and spicy characters in an easy drinking smooth style. Food friendly and crowd pleasing!